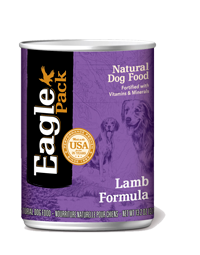 Eagle Pack® Lamb Canned Dog Formula is a complete and balanced diet for dogs of all life stages. Fortified with vitamins and minerals, Eagle Pack canned dog foods are ideal to feed as a complete meal or in addition to a dry diet. Lamb, Chicken Broth, Lamb Liver, Ground Brown Rice, Carrots, Ground Barley, Dried Egg Product, Potassium Chloride, Dicalcium Phosphate, Carrageenan, Cassia Gum, Guar Gum, Oatmeal, Minerals [Iron Amino Acid Chelate, Zinc Amino Acid Chelate, Cobalt Amino Acid Chelate, Copper Amino Acid Chelate, Manganese Amino Acid Chelate, Sodium Selenite, Potassium Iodide], Alfalfa Meal, Flaxseed, Olive Oil, Salt, Vitamins [Vitamin E Supplement, Thiamine Mononitrate, Biotin, Vitamin A Supplement, Vitamin B-12 Supplement, Vitamin D-3 Supplement, Riboflavin Supplement], Choline Chloride. Eagle Lamb Formula Dog Food is formulated to meet the nutritional levels established by the Association of American Feed Control Officials (AAFCO) Dog Food Nutrient Profiles for all life stages. Calorie Content: This food contains 1,495 kcal/kg or 561 kcal/can ME (metabolizable energy) on an as fed basis (calculated). AAFCO Statement: Eagle Pack Lamb Formula Dog Food is formulated to meet the nutritional levels established by the AAFCO Dog Food Nutrient Profiles for all life stages. Calorie Content: This food contains 1,495 kcal/kg or 519 kcal/can ME (metabolizable energy) on an as fed basis (calculated).